The Swachh Rail – Swachh Bharat campaign got off to a big start o­n South Central Railway with the commencement of the fortnight long, “Swachhta Hi Sewa – Pakhwara” today i.e., 15thSeptember, 2018 which will culminate o­n 2nd October, 2018, the Gandhi Jayanthi Day. The program, coinciding with the Swachh Bharat Mission of Govt. of India, commenced with the live address of Shri Narendra Modi, Hon’ble Prime Minister of India, which was telecast at all major railway stations and at offices. Thousands of railway employees and travelling public viewed the message of the Prime Minister, who stressed o­n the importance of cleanliness and the success of this Clean India Mission started four years ago. Shri Bandaru Dattatreya, Ex. 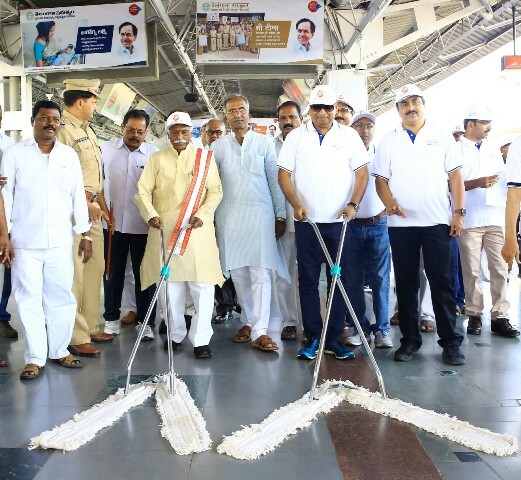 Union Minister & Hon’ble Member of Parliament, Secunderabad joined Shri Vinod Kumar Yadav, General Manager, SCR at Secunderabad Railway station to witness the event and interact with the Safai Karmacharis (cleaning staff), several of whom were also honored for their services. At Rail Nilayam, the Headquarters office of SCR at Secunderabad, railway employees assembled together to take the Swachhta Pledge administered by the General Manager and followed it up by undertaking cleanliness activity of the entire office premises. Shri John Thomas, Additional General Manager, SCR, Principal Heads and other senior officials were also present. The main event for the day was at Kacheguda, where the General Manager, Shri Vinod Kumar Yadav was joined by the top Telugu Film Producer, Shri Dil Raju to launch the Swachhta Hi Sewa – Pakhwara by formally inaugurating a big innovation, the air-conditioned Mobile Digital Movie Theatre, setup by New Delhi based M/s. PictureTime DigiPlex. This innovative first of its kind media option being used o­n Indian Railways will showcase films o­n Swachh Rail – Swachh Bharat and other social awareness themes related to railways. The Mobile Movie Theatre, which can accommodate around 150 viewers at a time, will also be playing the latest Hindi and Telugu feature films, more particularly those carrying a Social Message to the society. Shri Vinod Kumar Yadav, in his address expressed the idea that the use of Mobile Movie Theatre for creating public awareness o­n issues concerning railways will be explored sizably, since the medium is capable of carrying the message to impact the masses. The General Manager in his address also expressed confidence that SCR, which is known as o­ne of the front ranked railways in terms of maintenance of cleanliness standards, will continue to strive to attain the optimal best. The entire track length of SCR’s network will be periodically cleaned, he added. The General Manager credited theemployee workforce for their commitment which borne results and cited the 2nd rank that Tirupati station holds at all India level for cleanliness, although the station shows a continuous surge in pilgrim rush every day. Similarly, the top ranks that Secunderabad, Hyderabad and Kacheguda railway stations hold at All Indian Railway Level in cleanliness quality is a reflection of the efforts of SCR, he added. Earlier, the General Manager felicitated the train maintenance staff including those involved in maintenance of sanitation and cleanliness at Kacheguda, distributed the modern lightweight safety kit to patrolmen / trackmen. He later joined the signature campaign towards reaffirming the commitment to Swachh Rail – Swachh Bharat. The ensuing Swachhta Hi Sewa – Pakhwara will see a host of activities including Swachh Awareness, cleanliness dialog with public, clean trains, clean stations, community day, clean workplace, clean residential premises, clean food, clean water, clean toilets etc,.